Higgs Beach is nowhere near as glamorous or well known as Smathers Beach, the two mile long strip of sandy loveliness along the Key West coastline. But it certainly has enough to worth mentioning, and of course visiting. On this page we will try to lay down the best, and of course the worst of Higgs, as of course everybody has their own spin on what a great day at the beach is all about. I for one will take a day round the pool anytime of the day, but hey what do I know about things. 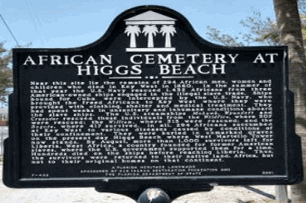 So let's start with where Higgs Beach is, and then we will let you know about amenities, local restaurants and attractions in the area to pad your day out if you get fed up with the sand and stuff. How Do We Get To The Beach Then? 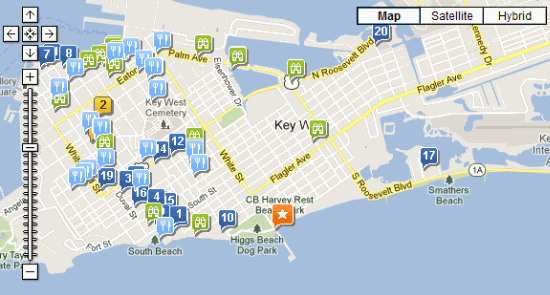 Well if you look at the map of Key West, you will of course see that there is an awful lot of water around. At one end of the island there is the Gulf Of Mexico and at the other is the Atlantic Ocean. 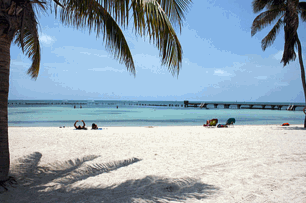 The beach can be found on the Atlantic side of things, which means its nearby neighbours on the map are the Casa Marina Key West Hotel, The Key West Garden Club and the Key West Wildlife Rescue Center. The Wildlife Center and Garden Club will be expanded on later, as good places to go to provide a little variation to your day. What Is The Parking Like At Higgs Beach? This is a great thing about the beach that unlike the majority of Key West where to be honest the parking is a nightmare, down at Higgs Beach it’s free, although not what I would say as plentiful. But get there early enough and you should be ok. 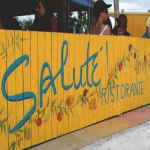 If you want to know more about other areas of parking that is free in Key West, or even ways to beat the parking issues then simply click here. The one thing you don’t want to do when you visit anywhere, especially a beach where you can be wet and sandy, is to keep on shooting back to put coins in a parking meter. That is annoying with a capital A! What Is The Beach Actually Like. Can You Do Swimming And Stuff? Well if you fancy swimming you can, but I prefer not to. Because of the way the tides flow in this area of Key West, quite often you get a lot of things floating around on the surface or being washed up. The City spend a lot of time cleaning the beach up of driftwood and seaweed and other sea nuisances. If you are really early in the morning, or very late (The Bars and Pubs do close very late in Key West after all), then you can often see the tractors raking the beach to make it nice for that days visitors. 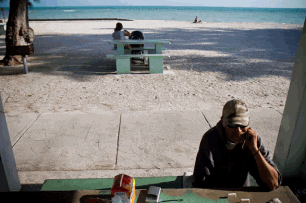 Also it is worth knowing that like the majority of beaches in Key West and the Florida Keys, Higgs Beach is not a natural beach and has the sand imported from the Caribbean to make it nice and sandy. But the fact that it isn’t bona fide natural shouldn’t make a jot of difference to you, although I have seen people moaning on forums about the fact. Come on people what do you want to walk on? Imported Sand = Ahhhh That’s better. But getting back to the swimming, you can do this, but you will find the best place especially in regards to snorkeling is a bit further out by the pier. The water is much clearer and free from debris, and it’s not unusual to see stingray amongst the plentiful fish. Which is a delight for out of towners who are not used to being around such things. Are There Amenities To Be Used At Higgs Beach? 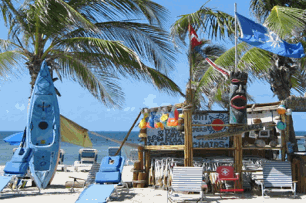 There is a concierge service at the beach called Tropical Watersports Key West who have quite a good deal going, especially if you want to stay all day. For just $30 you can hire two two lounge chairs, one umbrella and have the use of all equipment from the list below, which will certainly make your day more comfortable and interesting. They can also arrange any of the following, but this won't be part of the deal mentioned above. Dolphin Tours, Jet Ski Tours, Parasailing, Snorkel Trips, Fishing Charters, Restaurant Info, Sightseeing Info, Notary Services. What About Showers And Stuff? Higgs Beach has not got a lot of cleaning facilities, but it does have an outside shower which you can use to clean of the dried sand that gets stuck to you. No one wants to travel home with half a beach stuck to them after all. There are also restrooms, which are generally quite clean and well looked after. But other than that, I would wait until I get home to wash away the day spent at Higgs Beach. Is There Anything Bad About Higgs Beach? Higgs Beach with its palm trees and picnic tables is a really nice and somewhat shady place to sit and rest. And so it's not surprising that it does seem to attract more than a few homeless folk, who loiter around the place, watching the world go by or sleeping. They never worried us at all, but I am aware of other families that would have prefered for them to go elsewhere. Although I think that is a bit harsh as long as they don't hassle anyone, or cause problems then let them stay where they are. What Else Is There Around The Beach If I get Bored With Sand And Water? You have quite a few options if you do get bored with being at the beach. For the little ones there is a kiddies playground across the road, with swings, climbing frames and stuff which they will love. Another for the kiddies is Key West Wildlife Rescue Center, which is located inside of the eight area park at 1801 White Street, which is just down the road from Higgs Beach. It's open seven days per week from 9am until 5:00pm and is where ill and injured animals and seabirds are brought before being returned to the wild. As is Martello Tower, which is part of the Key West Garden Center and is a lovely place to get out of the Key West heat for a while. Although the kids may get a bit bored. Another couple of things that maybe interesting is the nearby African Cemetery and AIDS memorial located at White Street and Atlantic Boulevard, at the entrance to the White Street Pier. The White Street Pier is a bizarrely long pier that stretches out from Higgs Beach and is an astonishing sight. This pier is so long that many people call it the "Road To Cuba"
Walking out to the end gives a lovely photo opportunity as you look back towards Higgs Beach and Duval Street, and for a moment savour Key Wests natural beauty, but for once not in the midst of it all. All in all I hope that I have given as much information as I can for you to decide whether Higgs Beach Key West is a place for you and your family to enjoy. I have a feeling that you will. 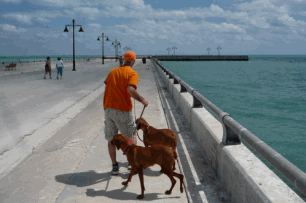 Which Way Is Key West Then?...It's The Dot Over There Dogs!